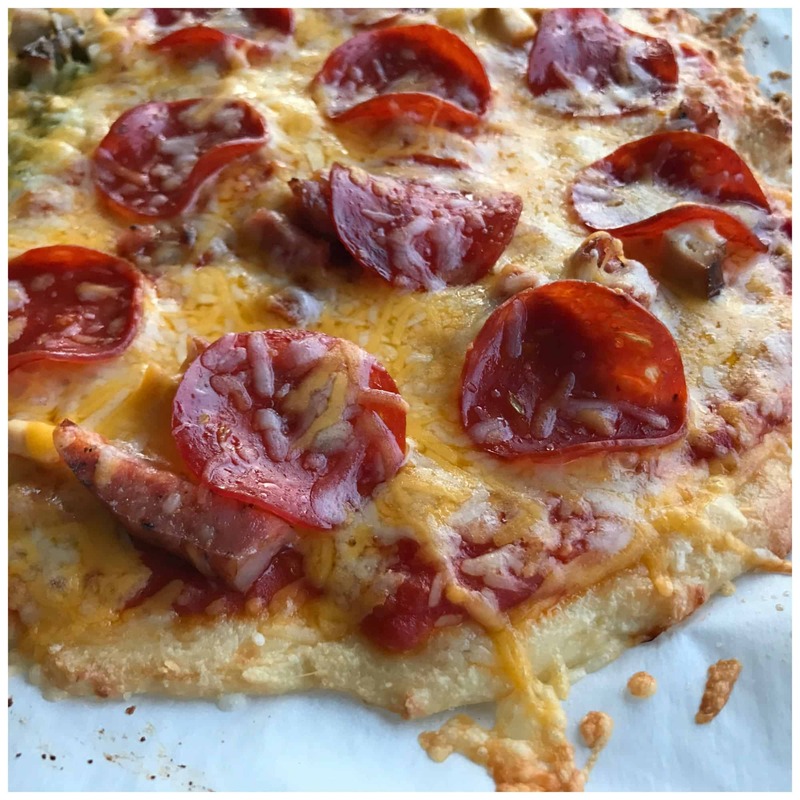 I have tried so many different versions of a Low Carb Keto Friendly Pizza Recipe and finally found one that I am going to stick to! 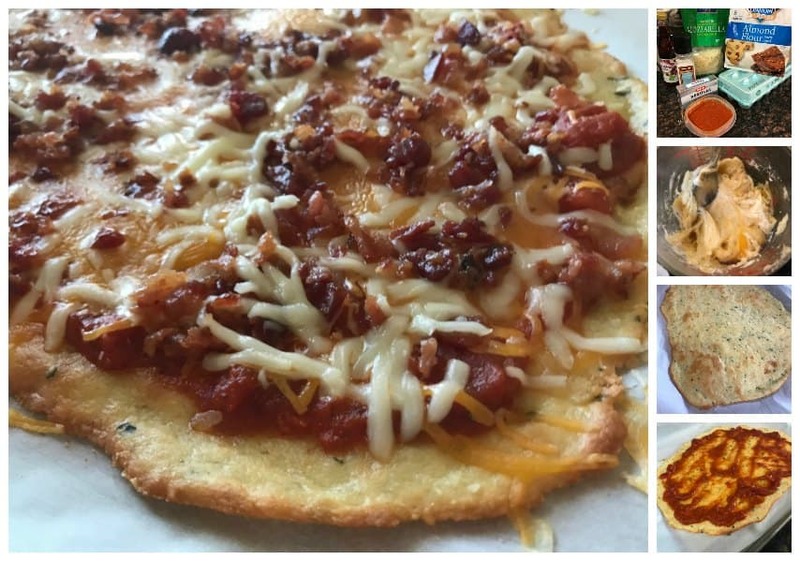 Some of the recipes I tried tasted like pizza on an egg plate. 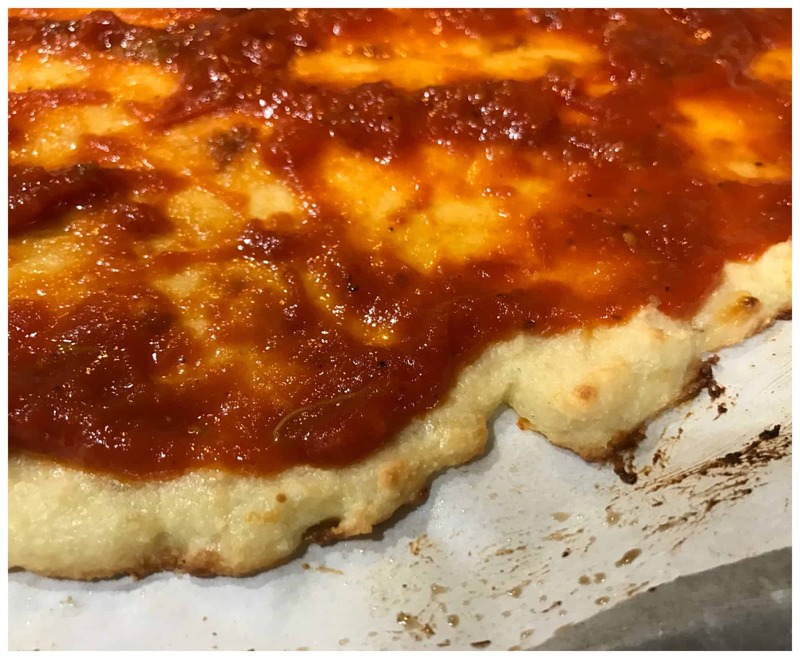 I wanted the pizza dough to have a similar taste and texture to that of real pizza dough and I’ve got it! 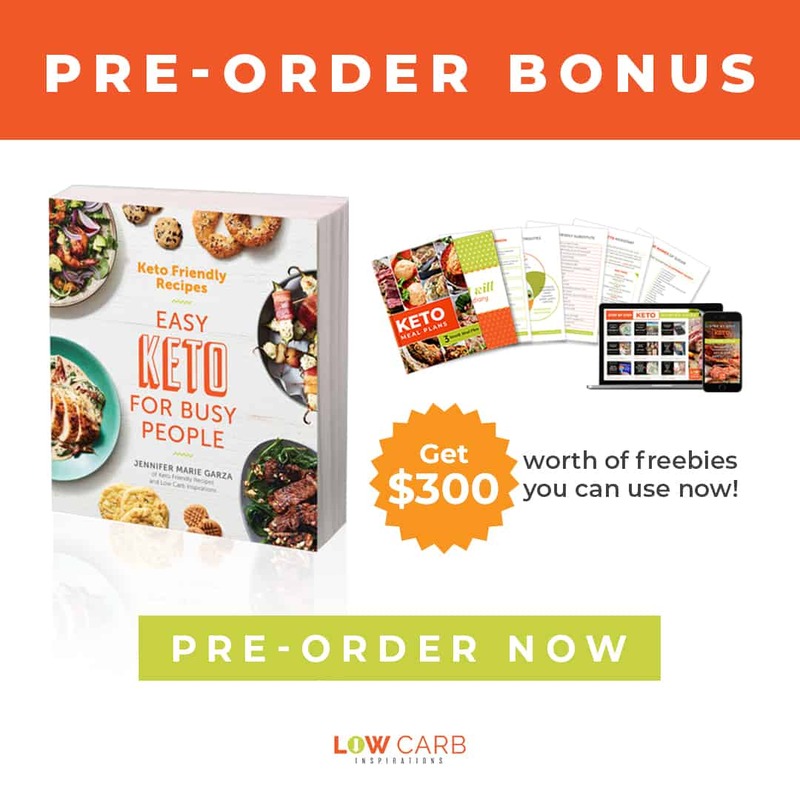 Now if you are new to the Ketogenic diet, this article, Simple Way to Start the Ketogenic Diet, lays out exactly how this diet works but it’s a simplified version! Before we start, take a minute to add yourself to our special email list so you can be included in lots of good information such as Recipes, Tips, Printables and Meal Plans! We’ve got some amazing information to share and I don’t want you to miss out! 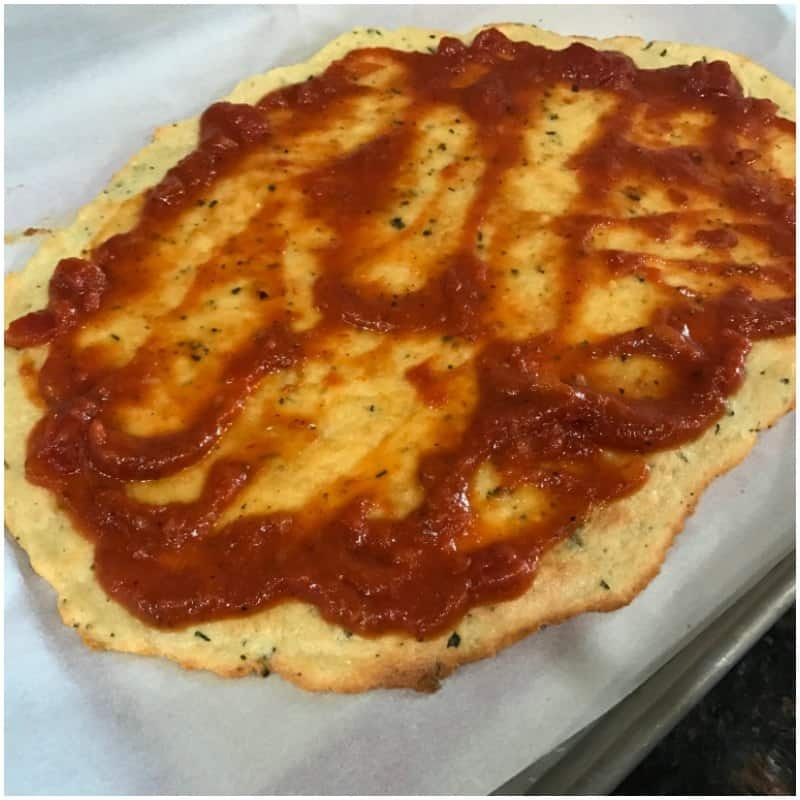 This pizza dough is made very similar to our Low Carb Cheese Crackers – Keto Friendly recipe with just a few slight differences. These crackers are definitely cooked a lot longer to get that crispy texture that’s oh, so good! I’ve tried the Real Good Pizza (pepperoni) and I honestly liked it! The price is a bit on the high side but the taste was good! 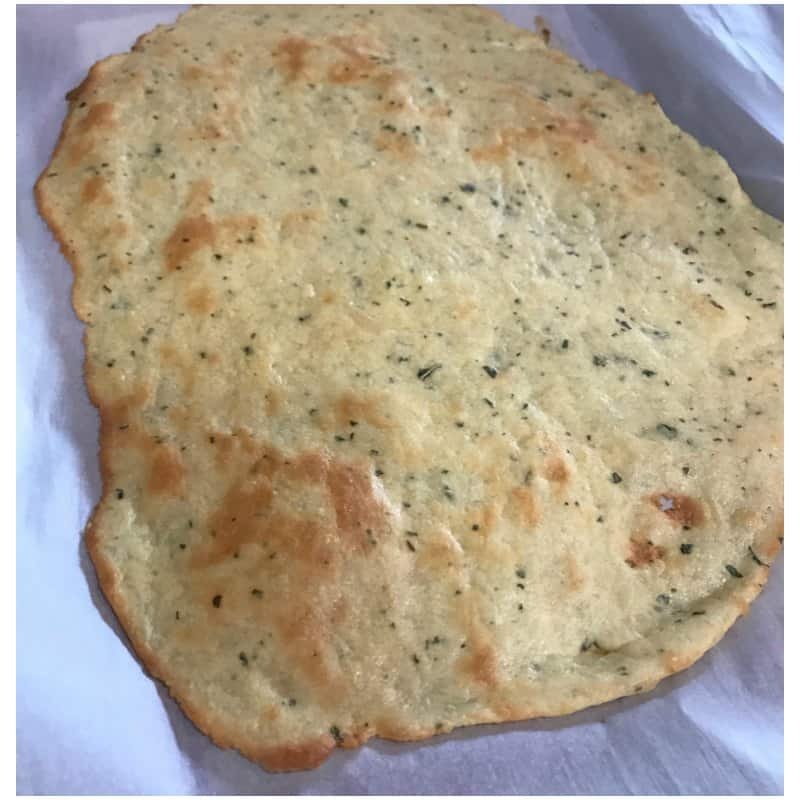 It’s made with real ingredients so you can’t really compare it to the cost of regular pizza because chicken is much more expensive than a flour dough any day. Keep that in mind when you think of the price. I found the toppings to be plentiful and the pizza to be filling. In fact, I ate about a half and was full. You can tell the crust is make out of chicken. It doesn’t have that breaded taste like the below recipe. I’ve kept a few of these pizzas in my freezer for days I really don’t feel like cooking. It’s right next to my Halo Top Ice cream (a rare treat). Finding these pizzas might prove to be a bit more difficult because they seem to be a newer company. I have found them in Kroger stores or available online. 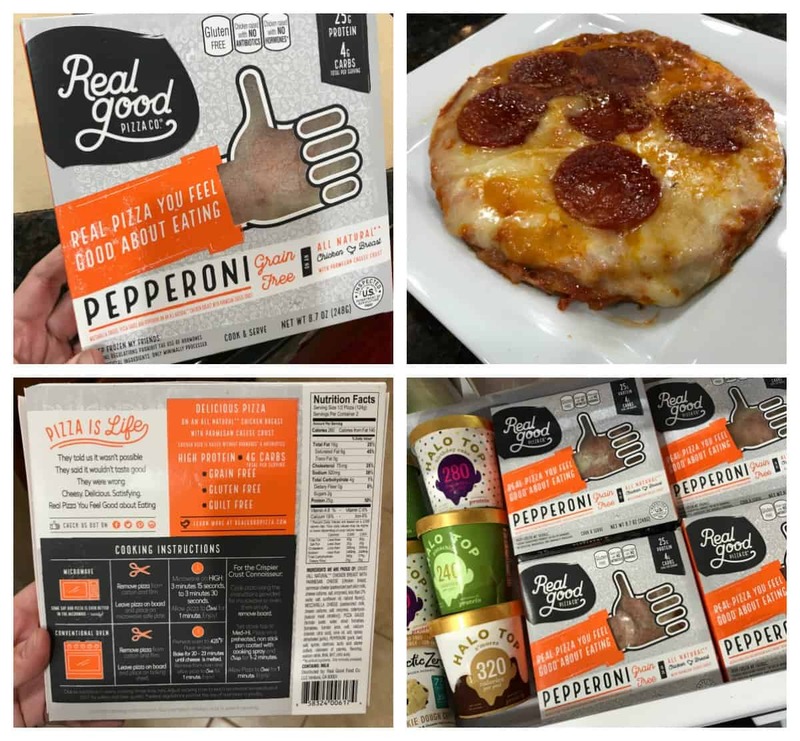 You can head over to the Real Good Foods website and enter your zip code in the store locator section too. I found them at a local nutrition shop just up the street. Yes, I will be making special trips to get this pizza there! Note: You can grab the printable version of this recipe at the very bottom of this post. 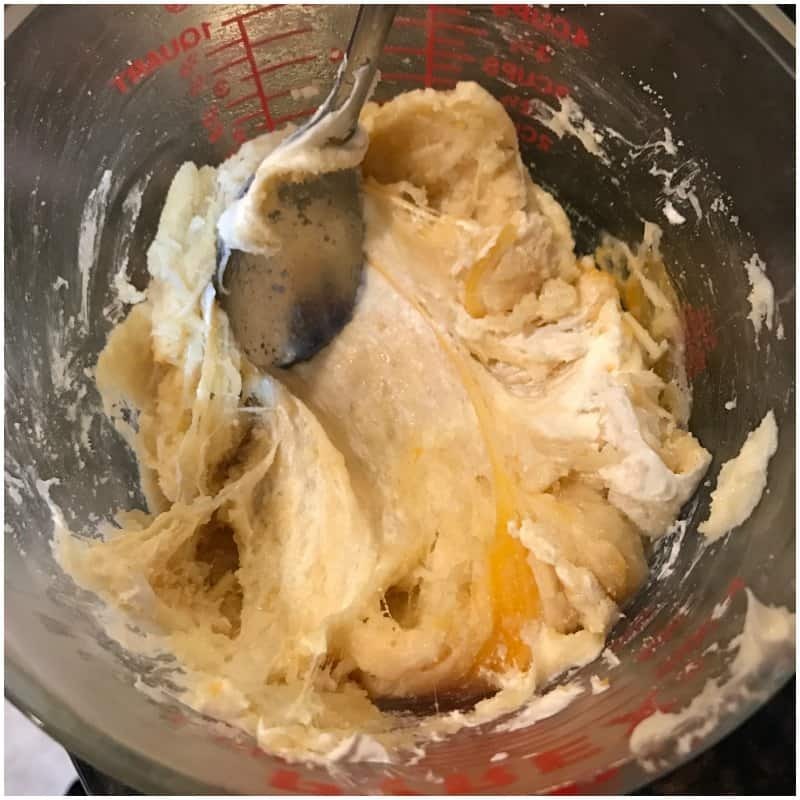 Add the shredded cheese, cream cheese and almond flour in a microwave bowl and heat it in 30 seconds bursts until the cheese has slightly melted. I usually only takes me a minute to make this happen. Carefully use a fork and mix the warm ingredients together. 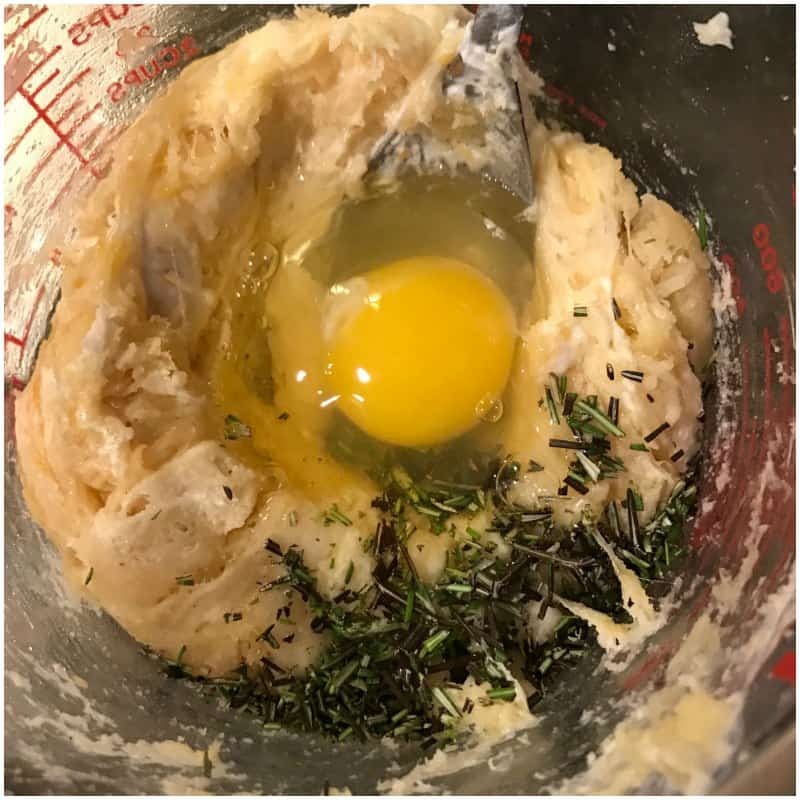 Add the egg, salt and rosemary seasonings to the dough and mix it thoroughly. The cheese must be warm and melted for it to mix correctly but not terribly hot that it will cook the egg. This dough will be a bit sticky. 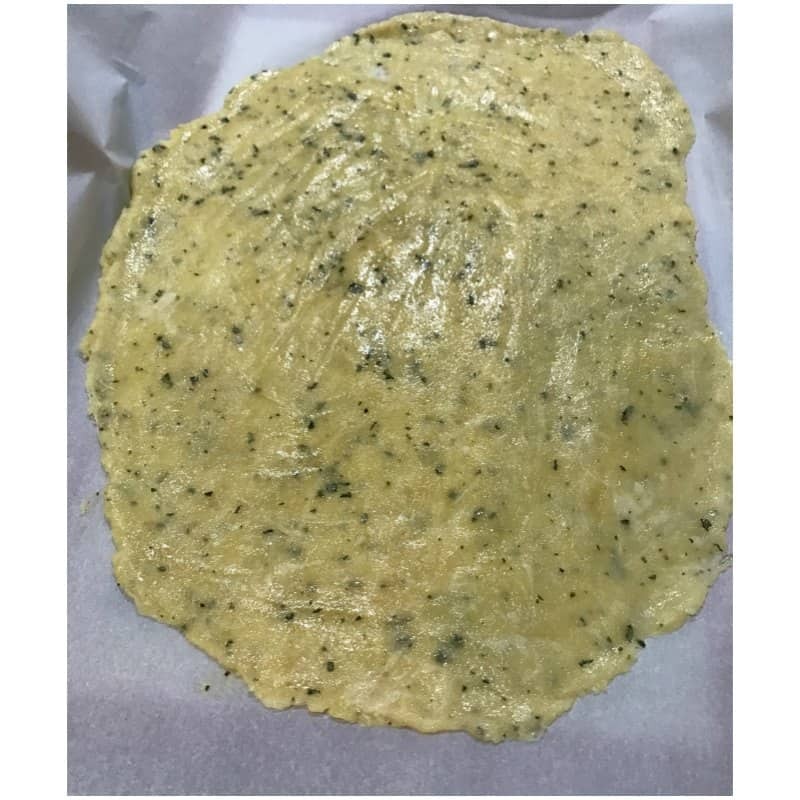 Use two pieces of parchment paper and roll the dough out till it’s as thick as you want it. I usually roll it pretty thin because I like a thin crust pizza. If I roll this dough thick I could probably get about 6 pieces of pizza out of this recipe but if I roll it thin I can usually get about 12 small slices. 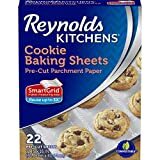 Remove the top layer of parchment paper and poke holes in the dough. Bake it at 350 degrees for about 12 to 15 minutes until the crust is a golden brown. 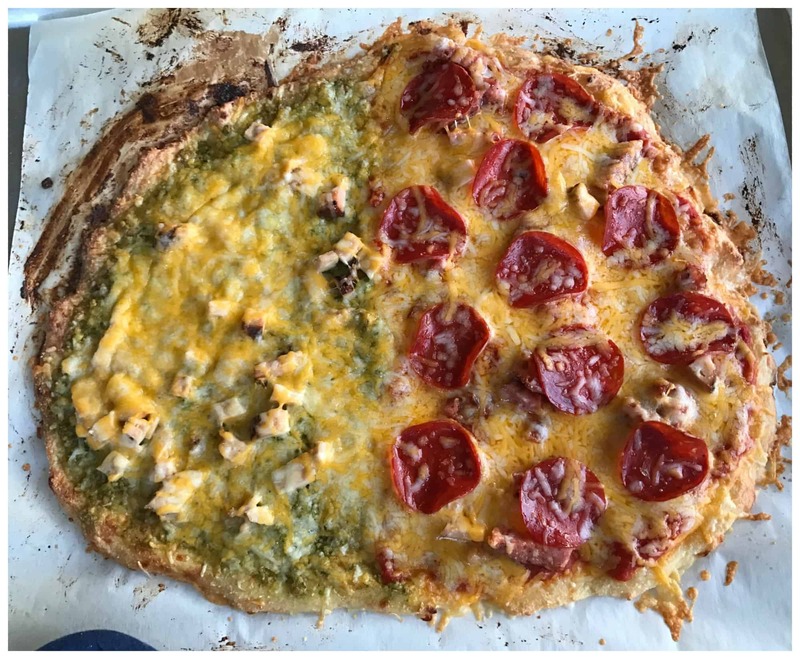 Remove the pizza crust from the oven and add your toppings! 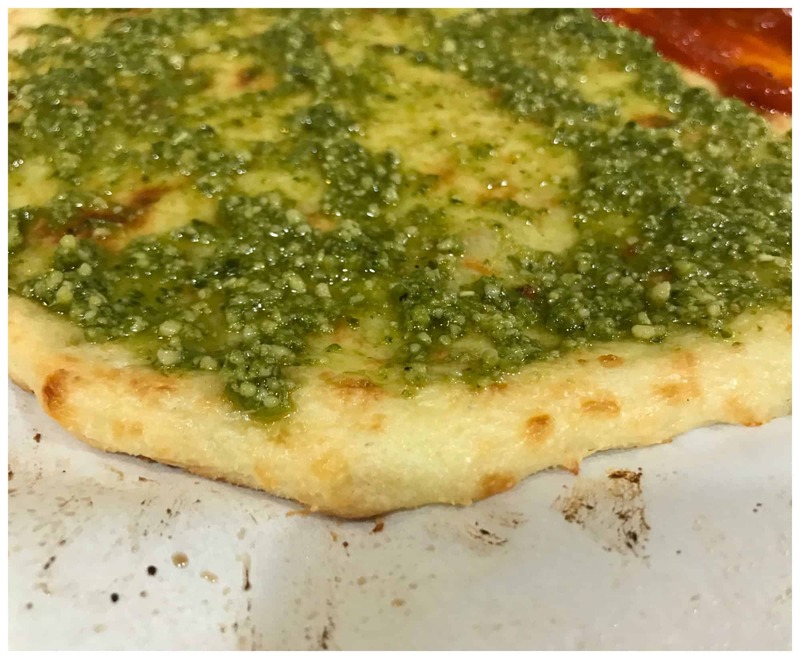 Once your toppings are complete on the pizza be sure to heat it for another 5 minutes to allow the cheese and toppings to heat. We’ve tried tons of different versions of this recipe and every single one of them come out amazing! Here’s an excellent tip for you! I made three different batches of this pizza. 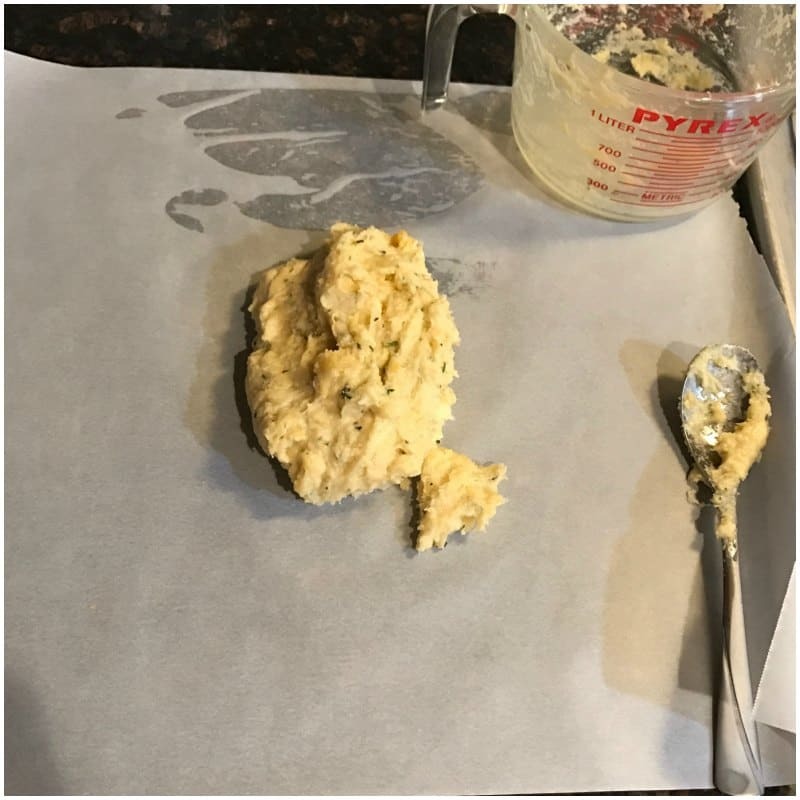 I rolled out the raw dough and left them between parchment paper and placed them in the freezer. They kept nicely and tasted amazing when I defrosted them. The recipe above makes two pizzas at a time. You can freeze the dough already rolled out in a circle or you can freeze it in a ball. If you freeze it in a ball, it will take longer to defrost. If you freeze it already rolled out, it only takes about 15 minutes to defrost. 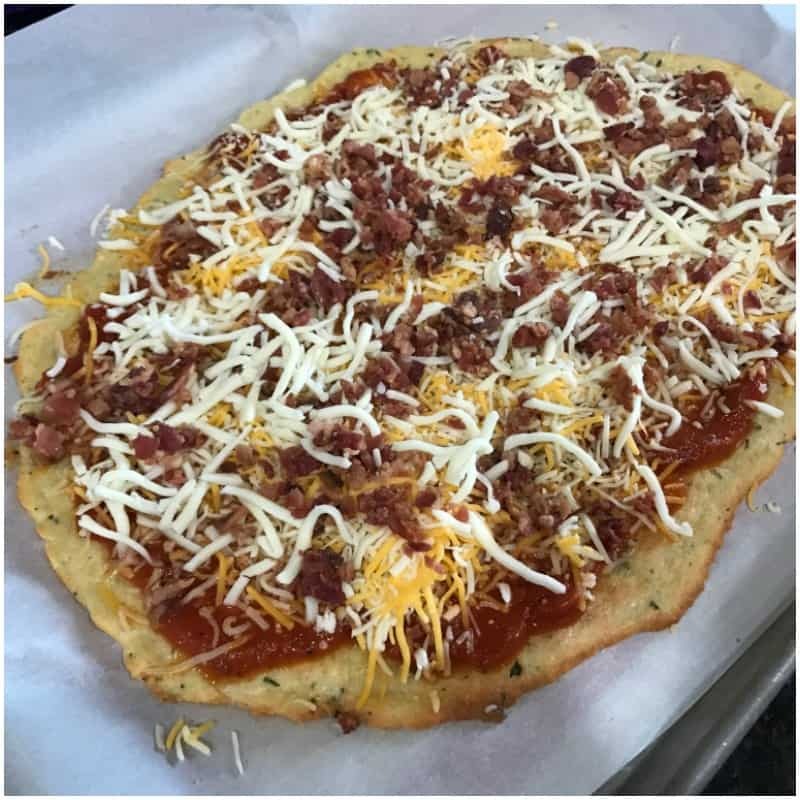 After it defrosts, I add the sauce and toppings and continue making these pizzas exactly like I do in the instructions above. I can’t tell the difference between frozen dough and fresh dough. They both taste great! If you like the plan out your meals and do all the hard work in one day this is an excellent way to save time during busy weekdays. 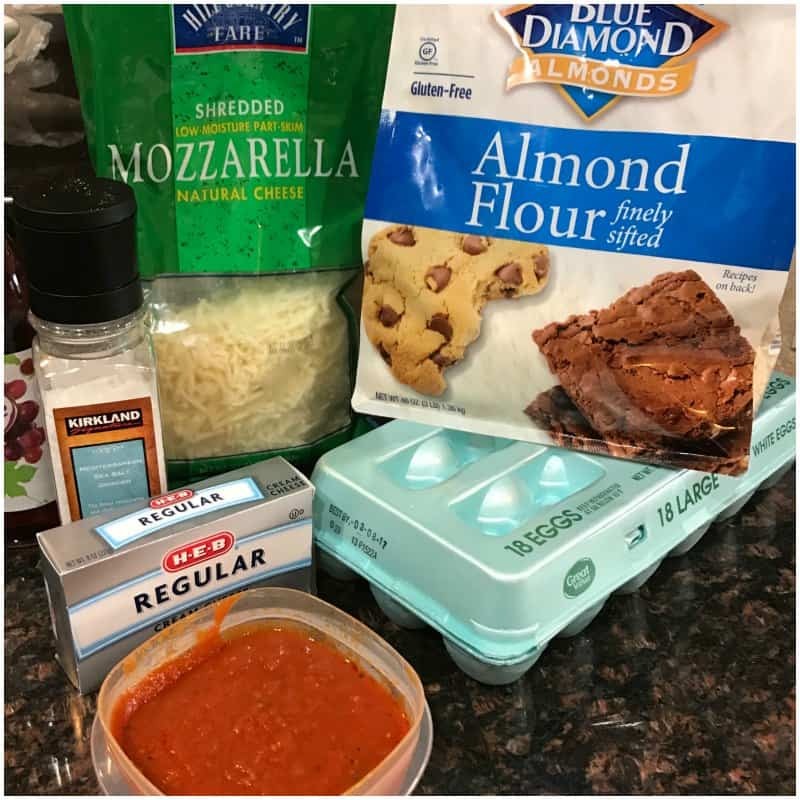 Add the shredded cheese, cream cheese <g class="gr_ gr_186 gr-alert gr_gramm gr_inline_cards gr_run_anim Punctuation only-ins replaceWithoutSep" id="186" data-gr-id="186">and</g> almond flour in a microwave bowl and heat it in 30 seconds bursts until the cheese has slightly melted. I usually only takes me a minute to make this happen. This dough will be a bit sticky. Use two pieces of parchment paper and roll the dough out till it's as thick as you want it. I usually roll it pretty thin because I like a thin crust pizza. If I roll this dough thick I could probably get about 6 pieces of pizza out of this recipe but if I roll it thin I can usually get about 12 small slices. 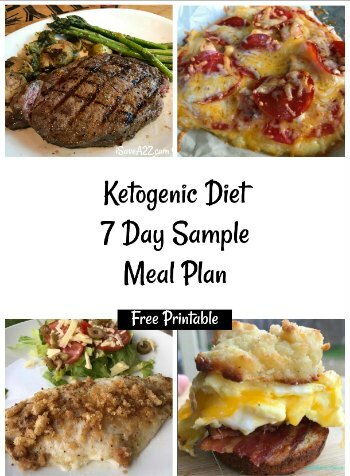 By Jennifer on February 22, 2017 Keto Breakfast Recipes, Keto Dinner Recipes, Keto Friendly Recipes, Keto Lunch Recipes, Main Dishes, Recipes. Thank you for an amazing recipe! 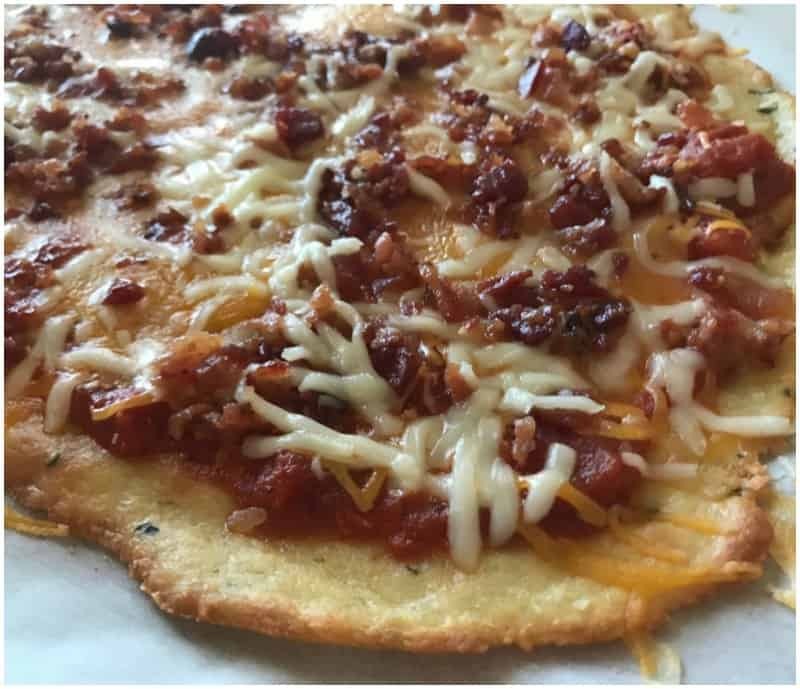 My husband just started the Keto diet, and he loved this pizza! Best of all, so did the rest of the family. (We’ve already made the dough twice in several days.) It is VERY easy AND tasty! I can’t wait to try more of your recipes. Thank you! This recipe was really easy. Best of all, my 2 year old picky eater absolutely loved it. This looks and sounds amazing! Can coconut flour be substituted? Thank you for the recipe. I am just wondering about the information to fill out for calories, protein, etc. 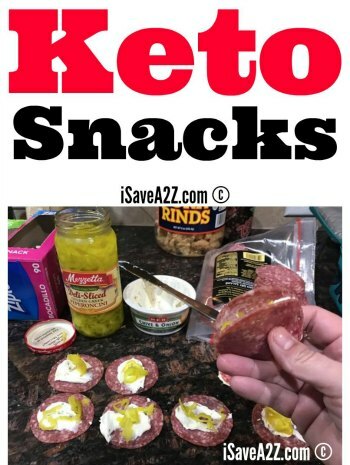 I am making this but do not know how to count it towards my keto journal. 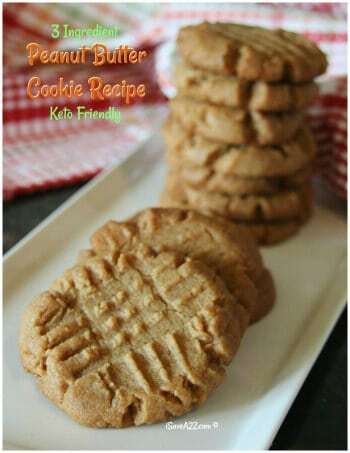 I just made this…..SOOO easy AND delicious! Making this tonight, Jennifer! 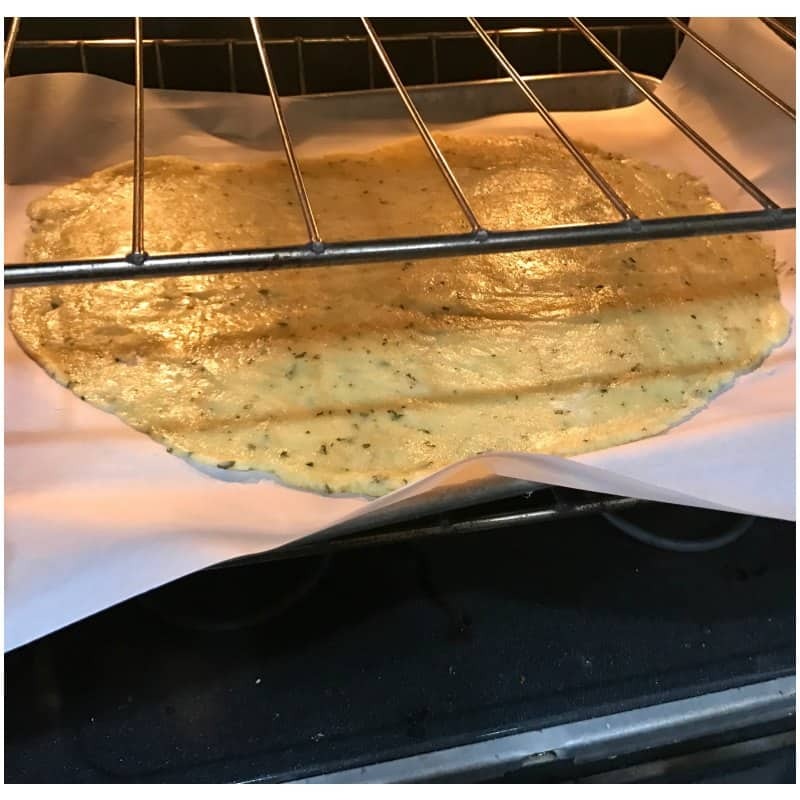 The crust is in the oven baking 🙂 It was much easier to make than I was anticipating– and my fiance was already so impressed! Can’t wait to finish it off with the toppings and enjoy 🙂 Thanks for the recipe!! !